Thank you for your interest in Manicomio Chelsea! 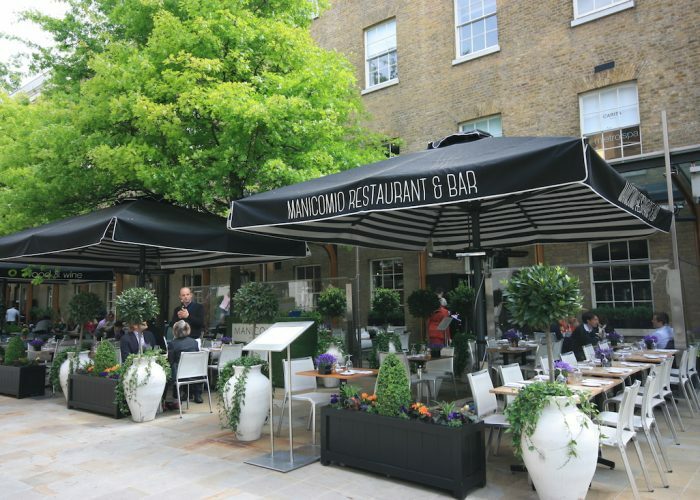 Manicomio Chelsea is the original restaurant from the Manicomio Restaurant group founded in 2003, located a stone’s throw Sloane Square, adjacent to the renowned Saatchi Gallery. Based within the former military asylum (Manicomio being Italian for Mad House), Manicomio’s location affords a unique standpoint set off the bustling Kings Road on the tranquil Duke of York Square and a terrace that offers the best leisurely people-watching in London. Manicomio’s dual dining experience, with both restaurant and deli/ café (Manicomio Poco) caters to all tastes; a destination dining spot with its modern Italian offering ranging from breakfast, lunch, light bar snacks and aperativo, dinner or weekend brunch. Manicomio’s bar serves up an original list of the finest cocktails with a thoughtfully produced wine list and a range of beers. 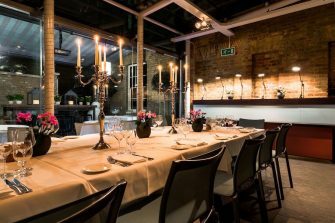 Our atmospheric candlelit conservatory serves as a private dining room seating up to 30 seated guests and 40-60 standing for cocktail parties. The Conservatory’s courtyard acts as a unique secondary al fresco venue for a drinks reception. Available for hire from Monday to Sunday, parties can create a bespoke menu from the restaurant’s a la carte menu which showcases the best of seasonal and elegantly simple Italian cuisine.